The high speed regulating wheel is twice as fast as conventional models, reduces maintenance time in half, and increases productivity. With double the speed, productivity is 40-60% higher when high speed regulating wheel is used in combination with top quality grinding wheels. 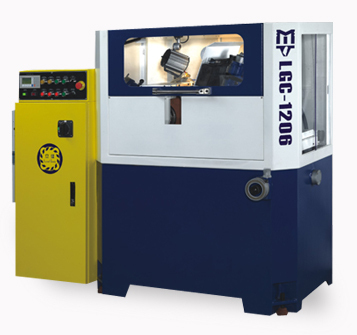 Optimal grinding occurs when the high speed regulating wheel is used in combination with top quality grinding wheels. High linear speed grinding wheel increases grinding efficiency, roundness, precision and surface roughness. 60% linear speed increase reduces grinding wheel wear and tear, and increases production capacity 40 – 60%. High linear speed grinding wheel reduces blockages of the grinding wheel air hole, increases chip removal efficiency and reduces maintenance down time. Low frictional resistance – Whether stopped or in motion under any operating conditions, a film of high pressure oil between the spindle and spindle bearing ensures there is zero direct metal to metal contact. The only resistance to spindle motion is oil viscosity. This saves energy and results in longer working life of the spindle. High rotational accuracy – The film of high pressure oil evenly distributes and maximizes load bearing capacity, and evens out any errors that occur over the course of grinding. Generally, any errors caused by hydrostatic bearing motion are only 1/3 of bearing surface errors - resulting in higher rotational accuracy. High rigidity even during heavier than normal loading and low eccentricity. High pressure flow of spindle oil reduces spindle heating. Excellent stability – The film of high pressure oil has a damping effect that maximizes stability and, as a result, surface finish quality of the work piece.